Congrats to Blue Elegance ASF, a Morab mare owned and shown by Jessica Smelter. 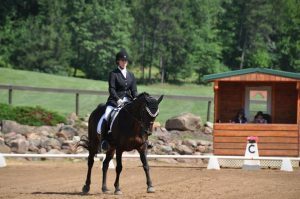 She recently won a USDF award in dressage for First Level Adult Amateur. This 1997 Morab mare is by the Arabian stallion RLink to Blue and out of the Morgan mare DCA April’s Elegence. What a wonderful example of a Magnificent Morab.